I have my work cut out for me this weekend.... Deconstructing this tower of books is my first task. But this is only about 1/10th of the books on my "medicine" bookshelf. Ideally, I'd like to read all of them before next week. Being realistic: that's probably not going to happen. Emergency physicians often seem to be criticised by doctors from other specialties for not going into enough depth in our assessment or treatment of patients, but what they need to realise is that the emergency physician must be able to switch from dealing competently with a child with meningitis one moment to an elderly patient with a hip fracture the next, then perhaps to a young man with an industrial eye injury (being called away to resus halfway through for a middle-aged banker having a heart attack) and back again to a woman with a complication of pregnancy, before applying a plaster cast to a teenager with a broken ankle. 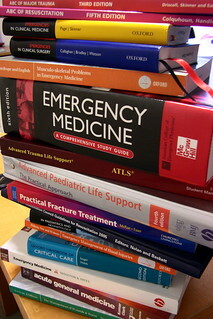 And until the emergency physician begins to assess these patients, he has no idea what might be the problem; it is the emergency physician who must decide which of these books might best apply to the patient who is in pain and frightened about what might be wrong with them - that's the hard bit! By the time the patient is referred to an inpatient specialty, a preliminary diagnosis has been made, many of the initial investigation results will be available, treatment will have commenced, and the patient might have had pain relief and a bit of time to re-think about the best way to tell their story accurately and concisely. I like emergency medicine. By and large, I like my patients. I am often privileged to be able to relieve pain, close wounds, and sometimes save lives. It's great. Most of the time, I don't like the NHS and I really don't like interfering nonsense from the government and busybody managers about how to do my job. I don't like late finishes followed by early starts and not having time to eat all day. I don't like being too tired to study or go to the gym, or even talk to my friends. EOS 400D - EF-S 17-85mm IS at 24mm - f/8 - 0.5" - ISO 800 - Faithful picture style.